Suddenly at the end of August, kiosks with melons — the real taste of summer — start appearing on the streets of Moscow. This piece is part of the Soviet Diet Cookbook, a blog about a modern Russian girl cooking Soviet food. To read more of the series, click here. Summer in Moscow is short and full of miracles: as a kid you might get away with not wearing slippers in the house, you can eat ice cream in the street and the city becomes dotted with lots of mini cage-like temporary kiosks selling melons and watermelons — colorful, delicious and available for a short time, the whole country goes crazy over them. The right melon or watermelon would get carefully selected using various methods (knocking on it to hear a dull sound is one that the Book recommends), schlepped home in a trolley and then savored either in the kitchen or on a picnic. Now you can buy pre-cut smaller pieces of melon or watermelon in shops, but when I was a kid, and certainly before that, there was no such nonsense — you got it all or none at all. Despite, or perhaps because of, that experience, Granny has certainly kept her affection for the “giant berries.” Every year she takes my brother to go on a melon and watermelon expedition: Granny goes as the quality expert, and my brother is trusted with the responsible job of carrying the purchase home. Special gear (a backpack) is used. My grandmother’s birthday is on Sept. 20, and cutting the watermelon (or melon, or both) is always a big part of the celebrations. Granny tastes the first piece as though it was fine wine in a restaurant and then approves: “the watermelon is sweet, all is good, we may proceed.” Then we all breathe a sign of relief and go to lunch. 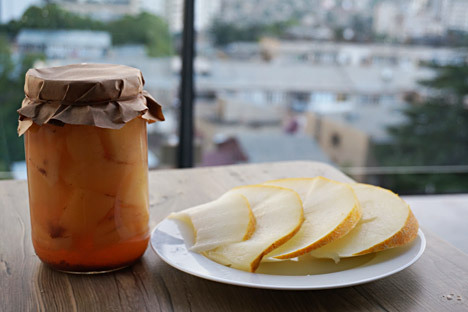 Although I wasn’t in Moscow this summer, I didn’t want to miss out on the delicacies, so I found what seemed to be an appropriate and delightfully weird recipe — marinated melon! I got tips from Granny on how to choose one, and then went through a very weird hour, during which I couldn’t but think of the fact that I have a glass jar with paper underneath it and melon with marinade in it – boiling! It took some courage convincing myself to taste it (yes, I’m sure courage is the right word), but it turned out I needn’t have feared — it tasted very light and pleasant. Granny says there used to be marinated, or salted, watermelons delivered from the southern republics in the Soviet times — although in Moscow and the other more northerly regions, the Soviet citizens would not leave any to marinate – it would be eaten all there and then, with only memories left to savor. Prepare the marinade: 1 cup of vinegar, 1 cup of water, ¾ cup sugar, 2 Tbsp honey, 2-3 cloves, a piece of cinnamon, a little allspice and ½ tsp salt. Combine all the ingredients in a saucepan, boil, cool and strain. Wash the melon, cut in half, remove core and seeds and cut the flesh into cubes. Put the cubes of melon into small jars, cover with marinade, close and tie with parchment paper. Put parchment paper in the bottom of a deep bowl. Put the jars in the bowl. Pour water into the bowl to mid-level of the jars and simmer for one hour. Remove the bowl from the heat and allow it to cool. Remove the jars from the water and store in a cold place. Serve the pickled melon as a salad with grilled meat and poultry.